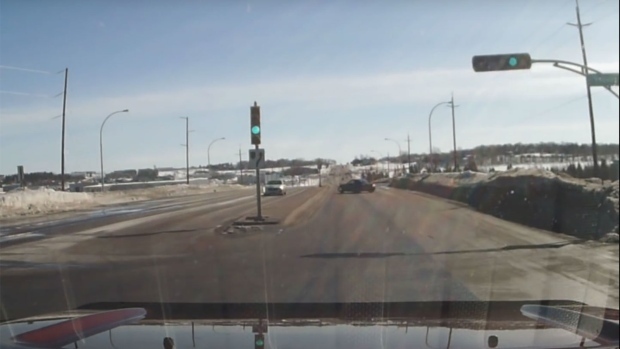 CHARLOTTETOWN -- A 32-year-old Charlottetown man whose Porsche was filmed wildly careening down a city street has learned the hard way that amateur dash cams can provide a prosecutor's dream evidence. Steven Green pleaded guilty to dangerous driving last month and was sentenced on Tuesday to 10 days in jail after the video depicting his wild and swerving drive went viral. He was also handed a nine-month driving prohibition by Judge Jeff Lantz at the Charlottetown provincial court hearing. Jeff MacDonald, the prosecutor on the case, said in an interview Wednesday that a truck just behind Green's car happened to have his dash cam running during the entire incident. "It's incredibly useful," he said in an interview. "In prosecutions typically we're limited to eyewitness testimony describing an incident. When you have a picture it's worth a thousand words and when you have a video, it's probably worth a million." The video -- which has close to two million views on YouTube -- shows Green accelerating out of a stoplight, fishtailing and initially crashing into a concrete median. The two-seat sports car veers to the right and then accelerates again to enter into the oncoming lane of traffic, where its rear right wheel comes loose and flies off before the Porsche comes to a rest. MacDonald said the sentence was a joint recommendation, and was based partly on two prior convictions for driving offences. Defence lawyer Peter Ghiz says while the video was useful evidence for the Crown, it also raised questions as to why the car would swerve so wildly rather than going in a straight line. He said his client had informed him his dog was in the front seat and stepped on a control button and then fell into the driver's side wheel well. However, Ghiz said that the defence accepted the Crown's proposal for the 10-day sentence, considering it a reasonable compromise. The Crown can ask for a maximum of six months in jail under the criminal code. "It (the video) cuts both ways. On the one hand it would suggest the person was grossly negligent ... on the other hand, what in the world happened to have made the video go in that direction," said Ghiz. Steve Kee, the director of communications with the Insurance Bureau of Canada, says his agency doesn't have figures on the number of dash cams being sold or precisely how they're being used. But he says the dash cams are turning up in court cases elsewhere in the country. "They're a bit of a silent witness ... It can be helpful," he said. Drivers purchase them for a variety of purposes, but one reason is to provide evidence in traffic accidents or other incidents on the road, said Kee.